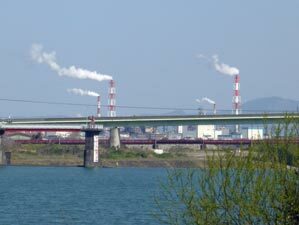 When the shinkansen finally pulled into Izumi station, it seemed like an eternity had passed since we left Australia, though the relief of arriving soon dispelled any remaining angst. 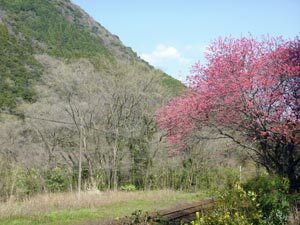 We got in at lunchtime and had the afternoon to kill, so, at the suggestion of Thomas our bike tour guide, we caught the local train to reach the village of Takaone, two stops down the track. 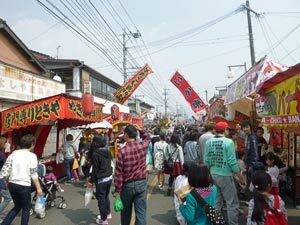 Here a village fair was being held and the locals were out in force (there was only one other gaijin to be seen and he had a Japanese wife and family). We joined in, wandering down the long rows of food stalls and sampling some of the wares - small barbecued crabs eaten whole, roasted sweet potato cakes, assorted kebab-like meats, noodle dishes and many others. 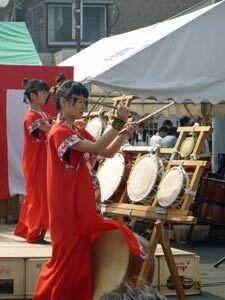 The highlight was to sit and listen to a couple of local Japanese drum bands - an impressive display of rhythm, synchrony and movement. 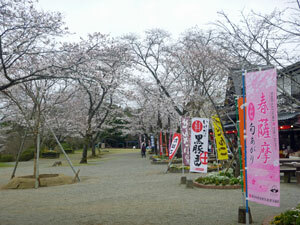 This was the Japan that few tourists get to see and we were grateful for the opportunity. 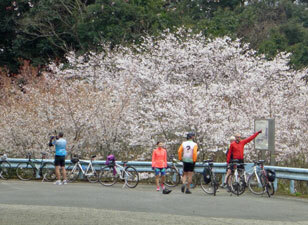 Back in our hotel at Izumi, others on the bike ride had begun to appear and it was time to meet and greet over dinner. As well as Thomas, our guide, there were 12 of us - the fair Nello and myself, Steven and Joyce from Hawaii, John and Hui from Taiwan, Mandy from Melbourne, Kevin and Helen from New Zealand, Ross and Abby from California and fellow Australian, Con. 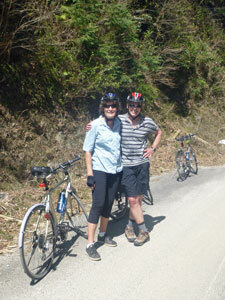 The group were friendly and congenial company - it augured well for a convivial week of riding ahead. 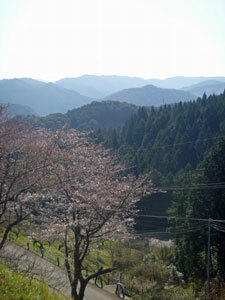 The balmy haze of yesterday was gone when we awoke, driven away by a cold Siberian wind. 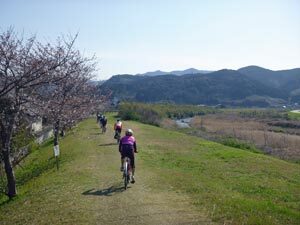 We would need our windproof shells for the start of our ride, but the reward was a great clarity of the landscape, the flat Izumi Coastal Plain and the green hills backing it. 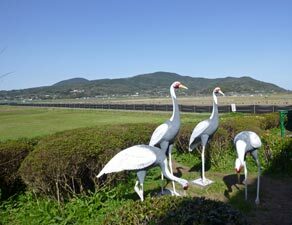 Izumi is famous for two things - cranes and samurai. 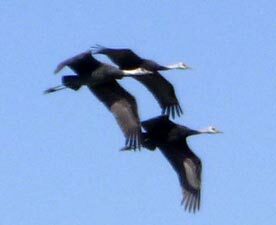 The cranes fly in each year from Siberia to overwinter on the rich coastal wetlands, before returning to Siberia in early Spring to breed. 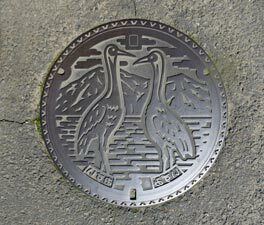 While most of the white-naped cranes had already left, large numbers of the hooded cranes were still around which gave us the chance to see these iconic birds (there are many crane statues around Izumi and even the manhole covers have images of cranes etched in the metal). 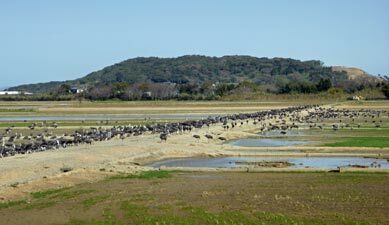 Thus, Thomas, our guide, led us out through the town and past the market gardens and rice fields of these exposed flat coastal plains, and into the face of the wind. 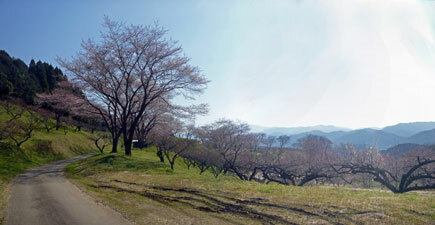 To be honest, it wasn't as cold as I had expected - with the sun also shining brightly. 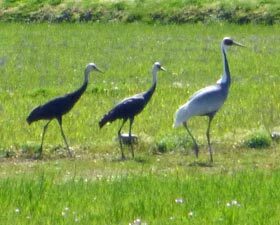 The odd crane and small groups of them soon appeared iin the fields as we neared the sea and eventually we crossed a broad canal to reach the main area, where flocks of hundreds of cranes gathered - a spectacular sight worth our morning detour. With the wind at our backs the return was easy. 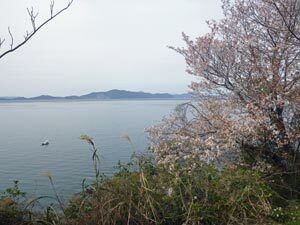 On entering the town, we rode down a street lined with cherries, some with white blossoms on display, some still with fat buds, and past the remnants of a naval air base, from where kamikaze pilots flew the "divine wind" to their deaths during World War 2. 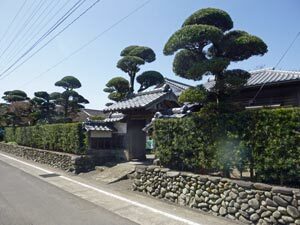 A little later our history lesson delved further into times past, as we rode through an old samurai village, where in previous centuries samurai lived in fortified houses with classic Japanese gardens and sculpted trees. 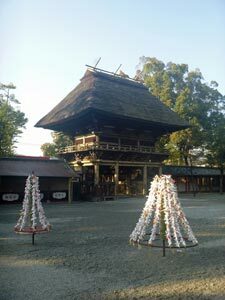 Izumi had one of the largest samurai villages in Japan as it was a border town between the Kumamoto and Satsuma regions. 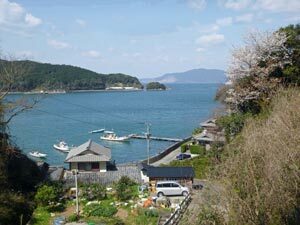 Our host at the house we visited dated his ancestry back to samurai of the 12th century. 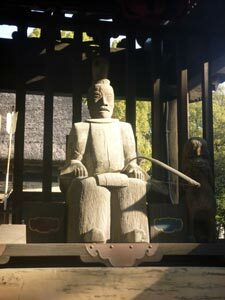 After visiting the samurai quarter, it was time for lunch - a feast with meat and vegetables that you grilled yourself on the table, plus numerous delicious extras and salads. With all that extra weight, the ride this afternoon was looking just a little bit harder. 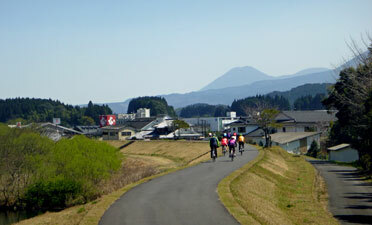 Feeling very well sated, we set off for the afternooon ride, passing quickly through the samurai quarter again to gain the countryside - this time inland up against the hills. Thomas led us along a quiet country road climbing gently up a valley with grassy fields, surrounded by the hills covered in a tapestry of different shades of green. A short section on the main road brought us to the start of the big climb of the day - the place where we burn off all those lunchtime calories. 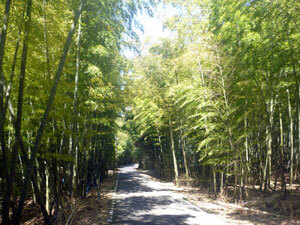 Seven kilometres of climbing awaited, but one with a steady gradient beneath the shade of the forest canopy and in the lee of the wind. It was a case of find your rhythm of cadence and breath and hold it - the peloton spread out as people settled into their different rhythms to eventually regroup at the top of Yahazu Pass. Once again we were in the face of the wind, so gear shed on the climb was quickly put back on, in time for a long and winding descent down through the forest and along the narrow Yude Valley. 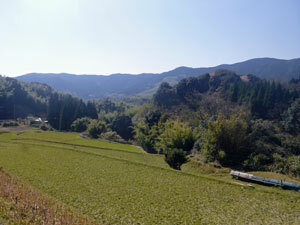 House and paddy fields cut into the valley slopes appeared and disappeared as we zoomed by. 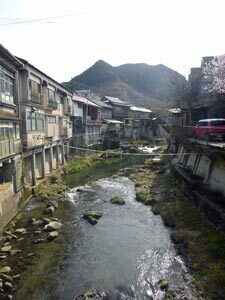 Eventually the valley opened out and flattened a bit, as we arrived at the picturesque village of Yunotsuru Onsen, old houses set alongside the banks of the rushing stream. From Yunotsuru the road flattened and pedalling resumed taking us quickly down the valley, despite the cold wind in our faces. 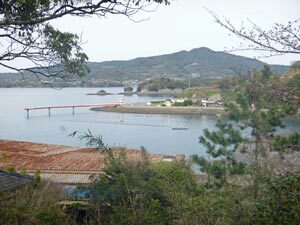 We soon reached Minimata, a coastal town which gained unwanted fame by being forever linked to "Minimata Disease", the symptoms of mercury poisoning due to environmental contamination in the 1950s and '60s. 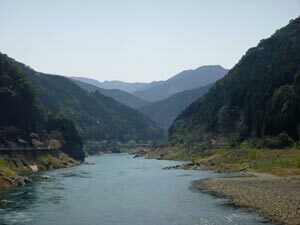 Thomas led us through the town and alongside the now broad river as it neared the sea. 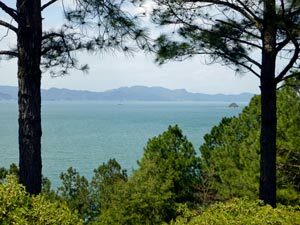 We turned north, gently climbing to a quiet coastal road. 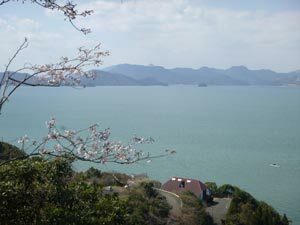 North of Minimata, the coast is rugged and indented, as the hills come down to the sea and it was very pleasant riding along this section of coast on a road dotted with cherry trees and lined with daffodils. 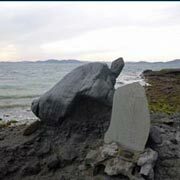 Out across the sea, the rugged blue profile of Amakusa Island stretched to the north. 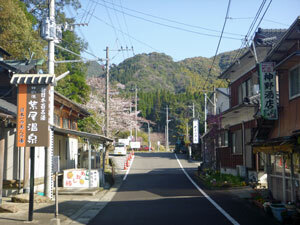 We soon reached our destination for the day - the little village of Yunoko Onsen. 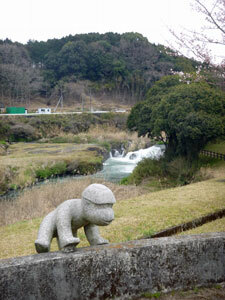 As well as the name, a faint waft of sulphur gave it away as a hot spring resort. Coasting down into town, we found our hotel - a somewhat luxurious establishment. 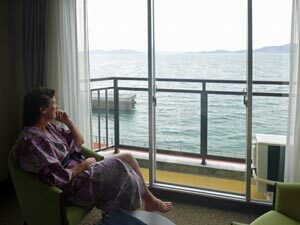 After settling in, the fair Nello and I headed off to the onsen (boys to the blue door, girls to the red door) for a relaxing soak in the steaming mineral waters of our respective outdoor baths - looking out across the trees to the sea and islands beyond as a pair of kites soared overhead and the cold Siberian wind sighed its way through the wooden frames - exquisite. 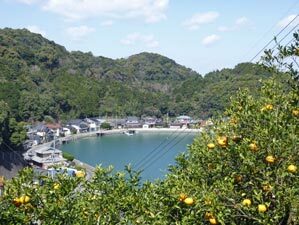 After a short leg-stretching walk across the bridge to turtle-shaped Yunoko Island, it was time to head off in our yukatas and savour the huge buffet dinner and a cleansing shot of Shochu (the potent rice spirit of Japan). 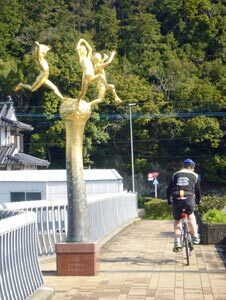 Thus ended a great first day of our bike tour in Kyushu. Our appetites were whet for the days to come. The cold front from Siberia had dropped temperatures even further - today the maximum was forecast to be only 11°C, driven down by the icy wind, but made tolerable by the clear skies and sunshine. 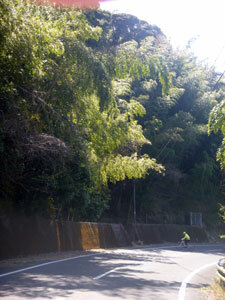 At 9am we were ready to roll, and Thomas led us on the short sharp climb out of Yunoko Onsen and back up to the road. 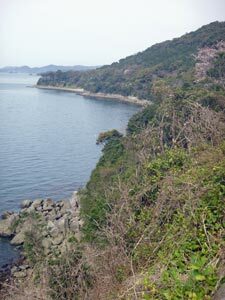 We followed it inland to cross the small headland and then headed back down to the sea. 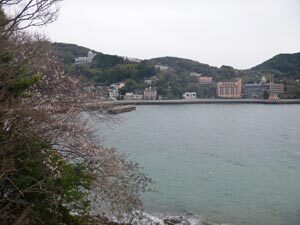 Thus began our journey along the steep and rocky shoreline of the Shiranui Sea, past a string of small fishing ports and villages, climbing gently to round headlands, where citrus orchards and narrow market beds clung to the steep slopes, before sweeping down into the villages, with their stone-walled ports that protected the fishing fleets from the sea. 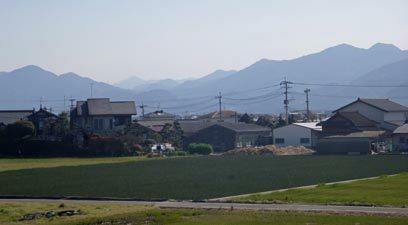 We passed several of the solar farms that are cropping up all over Japan since the Fukushima nuclear disaster. 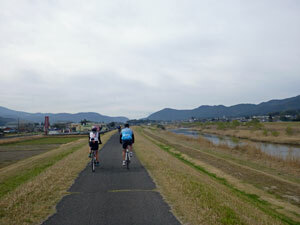 Our passage though the villages was made easier by the wide bike paths which paralleled the road. 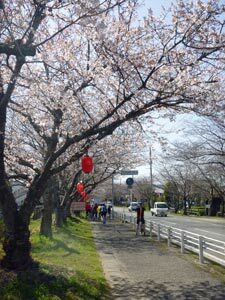 The cherry blossoms scattered along the route were either fat with full buds or on occasion out in bloom to form an arch over the road. 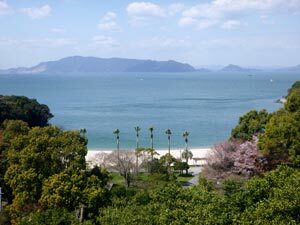 All the while, vistas opened up, past little rocky islets to the long and rugged profile of Amakusa and Shimabara Islands across the green-tinged sea, or of the steep and deeply indented coastline ahead and behind. 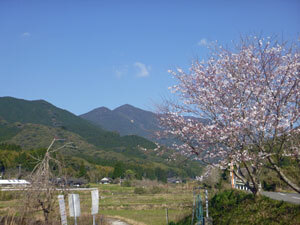 The scenery was superb. 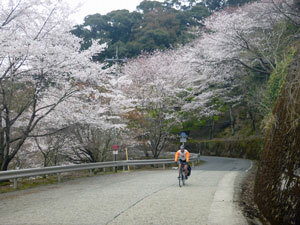 At times, we found ourselves riding into the face of the wind, at other times we were sheltered by headland and trees. 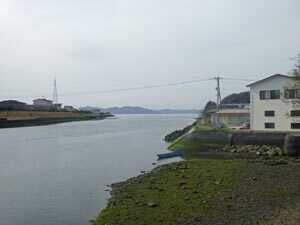 At one particularly deep inlet near Fukuura, we even had the wind at our backs, cruising along with little effort. However, we had to return on the other side and paid the penalty. 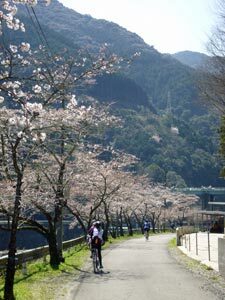 The reward for pushing into the wind was one of the most beautiful stretches of the route where the protected cherries were all out in flower. 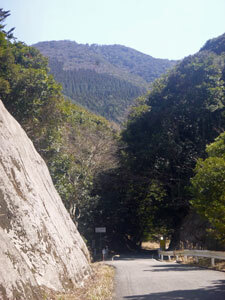 The route continued its way, passing more villages, a couple of road tunnels and even a broad sandy beach. 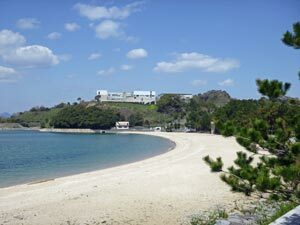 We made a brief stop at a 7-11 store to each buy a bento box for lunch, and headed off to the long sandy strip of beach at Otachimisaki Park to enjoy it, protected from the wind in a grove of trees. We needed the carb-loading, because after lunch came the biggest climb of the day, only 2 km, but all requiring the very bottom gear - it was hard work, but the zoom back down the other side made the climb worthwhile. 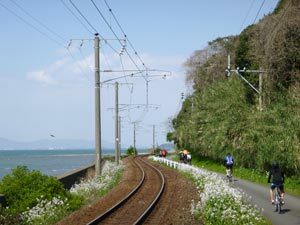 Here we picked up the little Hisatsu Coastal Railway, following and criss-crossing the tracks that followed the narrow strip between the mountains and the rocky shore-line. 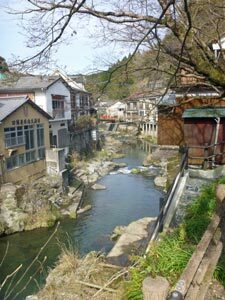 A final 2km along the only busy road of the day brought us into Hinagu Onsen, a town famed for its hot springs since the 14th century. 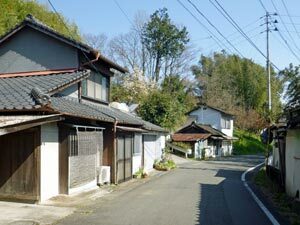 It was our destination and our accommodation was a 100-year old timber ryokan. What better than a hot spring footbath? 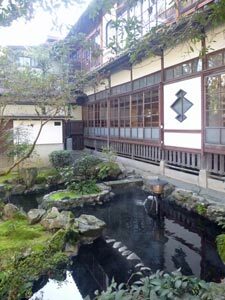 We had in fact arrived a little early to check in, so what better way to kill time then to sit in the circular hot spring foot bath in a little square, enjoying a glass of ice-cold Kirin. 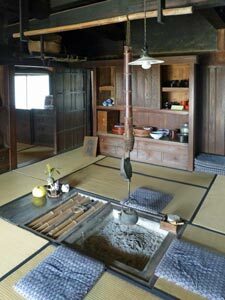 The ryokan was superbly authentic, with its tatami mats, papered doors and windows, timber floors polished to mirror-like surfaces and above all - its own hot spring. Soaking in the outdoor pool set in a zen-like garden, with steam drifting off the water was a great way to end another day of riding. 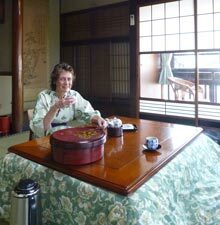 Sipping a cup of green tea made from a traditional tea-set, with our feet warmed by the heated drapes of the low table completely spoiled us. 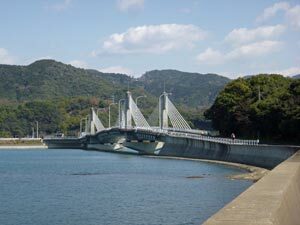 We can hardly wait for dinner, as Hinagu is famed for its sea-food, and riding 56 km along this magnificent stretch of coast-line in a cold wind has made us quite ravenous. 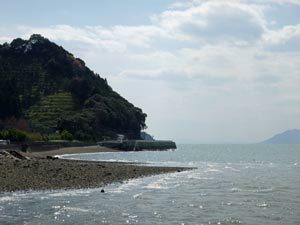 The Shiranui coast line has been compared to Italy's Amalfi Coast, but I think that is wrong - it needs no comparison, it is superb in its own right. 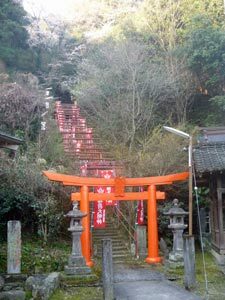 The fair Nello and I got up early to make the short climb in the brisk morning cold up to the Shinto shrine of the onsen god on the slopes of a nearby hill. 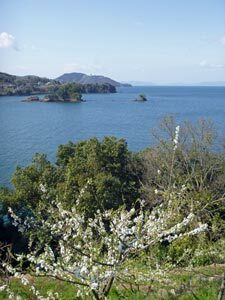 An ancient sumo ring at its base was surrounded with white cherry blossoms and, from the shrine, you could look out over old Hinagu and the coastal flatlands. It was worth the effort. 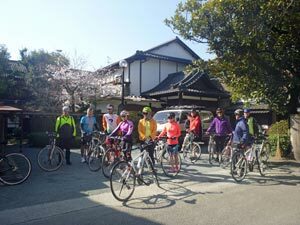 Then it was time to fill up on a traditional breakfast at the ryokan, pack up and head off into the cold but sunny morning for the longest section of our ride. At 9am, the temperature was still in the single digits. 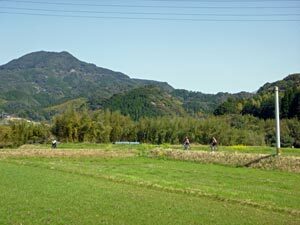 Thomas led a close-knit peloton out along the canals of old Hinagu town and into the flatlands, where the blue-tinted hills framed a region of market garden, rice paddy and glasshouses. 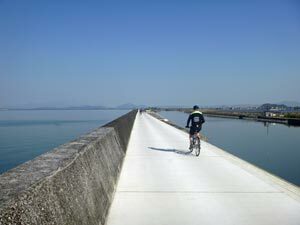 We reached the sea-wall protecting this rich farmland from the Shiranui Sea and rode along it into the face of a cold wind to the mouth of the Kumagawa River, where we swapped sea-wall for riverside dyke. 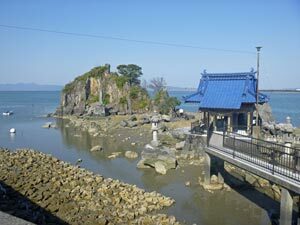 It was time to leave the sea behind a follow the river upstream. 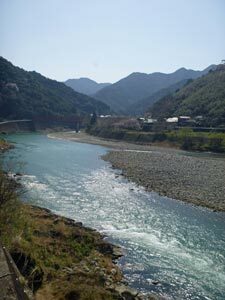 The wind was icy as we pushed onwards to cross the Kumagawa via the road bridge, before once again picking up a small riverside road. 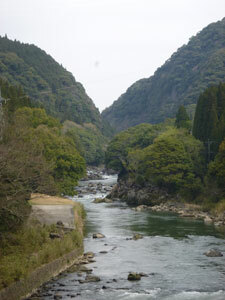 The good thing though was that the river was curving around and soon we had the wind behind us - what a relief. 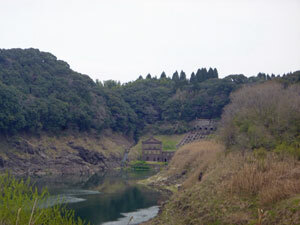 Passing by a heavily industrialised area, with barrages and quarries, the valley of the Kumagawa tightened around us. 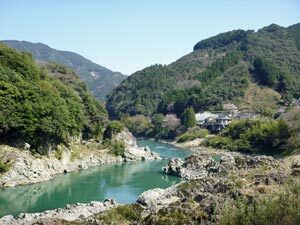 A series of paths and small roads led us through several small villages that lined the blue-green waters of the river, as it twisted its way through the surrounding hills. 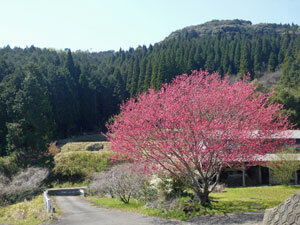 Cherry trees were scattered along the route and many were in flower in this more protected environment, arching over the road or framing the river and its hills. A stop for morning tea, and we were on the road again. 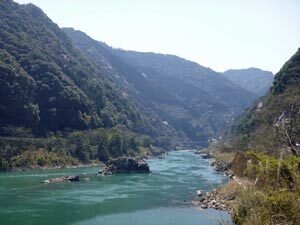 The river up this far, beyond the influence of the barrages, began to resume its wild state - with foaming rapids, narrows and rocky islets as it flowed down between steep forest clad hills. 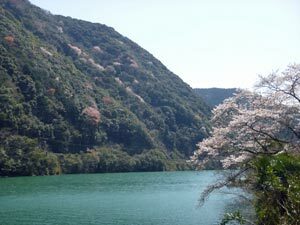 Scattered amongst the green of forest trees were the bright white-blossomed canopies of wild mountain cherries, adding to the beauty of the cultivated cherries that flowered along the river bank - it was a lovely section of the Kumagawa. 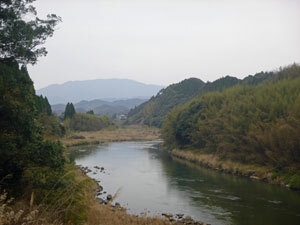 Thomas took us via small country roads and riverside paths, at one stage following a remnant of the ancient footpath to Edo around a rocky face. We crossed to the south side of the river to stay on these small and quiet roads - this section reminded us of a bike trip we did a couple of years ago down the tow paths of the Danube. 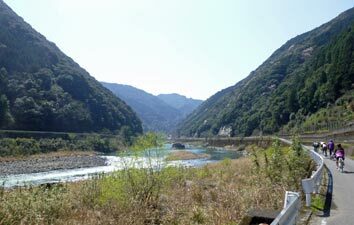 Not long after 12pm, we pulled into our lunch stop a small bento shop set on a sweeping reach of the river, surrounded by a particularly impressive set of valley walls. 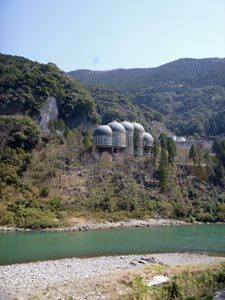 As usual the bento boxes were enormous, more than enough energy to power us through the last 20 kilometres to Hitoyoshi, our destination for the day. 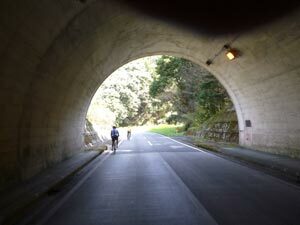 Pushing on, we passed though a road tunnel and along a small shaded road between river and railway track - the little two-carriage train blew its whistle as it passed by and the peloton rolled on. By now, the valley was beginning to widen. 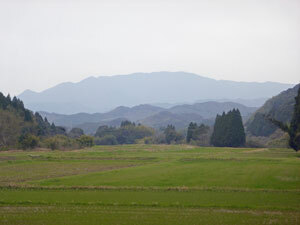 We had passed through the hills and were gradually moving into the broad plain of Hitoyoshi. 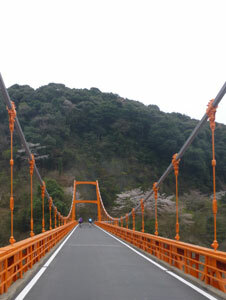 Crossing the river one last time via one of the many red-painted iron bridges, we picked up a short section of busy road, before finishing as we had started and following the long riverside dyke into the town - only this time with the wind at our backs. 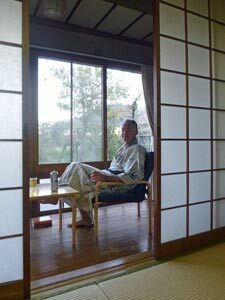 Once again a traditional ryokan awaited us, and after a green tea in a little ante-room overlooking our private moss garden, we were off to the onsen for what had become the traditional after-ride soak in a hot spring. This is the life. Dinner was again an exploration of Japanese delights (and mysteries), with at least 10 separate dishes washed down with a glass of plum wine. Food is certainly a major part of our trip. 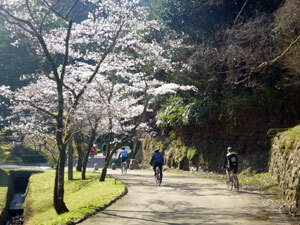 Perhaps the tour should be renamed the Cherry Blossom, Onsen and Feasting Tour. 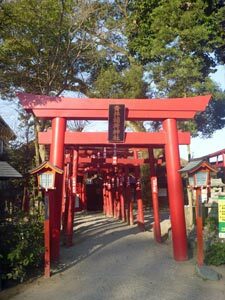 The morning air was again chilly as the fair Nello and I wandered over from our ryokan for a pre-breakfast visit to the nearby Aoi-Asa-Jinja, a 16th century timber and thatch-roofed shrine, behind red torii gate and a still reflective pond. 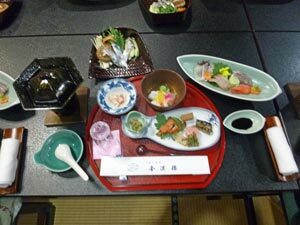 The breakfast was again enormous with lots of pots and plates holding varied soups, pickles, fish and cooked tofu. 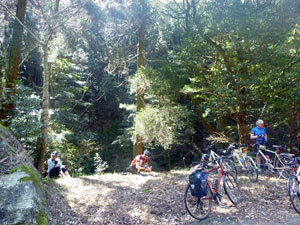 It was probably needed as today was the day of the big climb - a 750m pass lay between us and our destination. 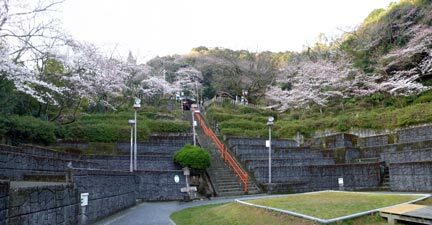 Heading out, Thomas led us through the streets of Hitoyoshi, through the parklands below the castle ruins - shady cold but highlighted by the luminous cherry blossoms, and out into the countryside. 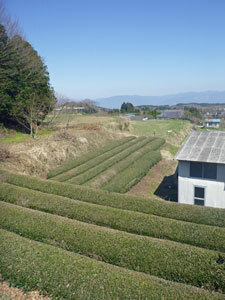 The track crossed open fields and the sun began to warm us up. Ahead, we could see the end of the flatlands and the hills rising beyond - we would soon be warming up quite a bit, as ahead lay an 18 km long climb to cross these ranges. Reaching the base of the climb, we shed our outer layers and set out, trying to find that steady rhythm that might get us to the top. 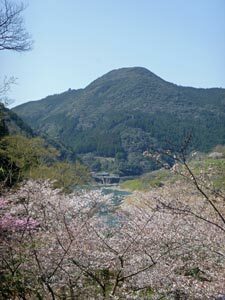 As we climbed, views opened up of the blue-tinted ranges to the east, framed at one section by a grove of cherry trees in a hill side pasture. 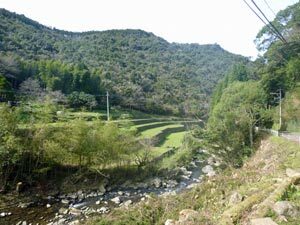 We zigged and zagged our way upwards to reach the station of the Hisatsu Train Line, which winds its way over the mountains in a series of loops, switchbacks and tunnels. Our route, on a quiet country road would be more direct - up and over. The station was a good place to stop for an energy boost before continuing. The train itself pulled in as we nibbled on our fruit and biscuits and then whistled us goodbye. Then it was off again, on an ascent of changing gradients, sometimes bottom gear, sometimes a few gears higher, but always upwards, as we passed a mountain tea plantation before heading back into the forest to wind our way up toward the pass. 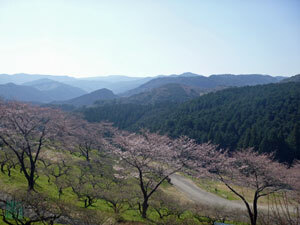 Suddenly, we were coasting down - into a high mountain valley. 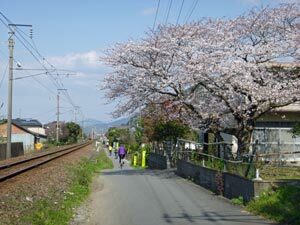 The climb had seemed all too easy as we stopped at Yatake Railway Station for a break. The explanation was all too easy as well - the climb wasn't over! 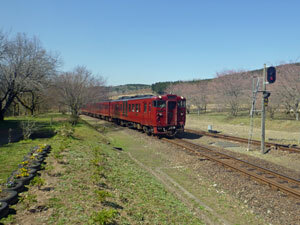 Thomas took us on a short cut across the train track to pick up a small road on the other side. From here another 150m of altitude lay between us and the crest - shorter, yes, but with a noticeably steeper gradient. 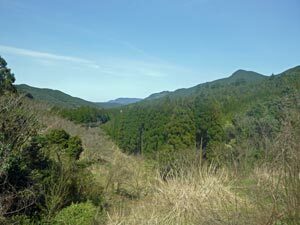 It was a great relief for both lungs and leg muscles to finally pass the mountain top tea plantation and reach the heights of the Yatake Plateau. Now it was time for outer layers to be put back on - ahead lay a 10 km long and winding descent and the air was still cold. 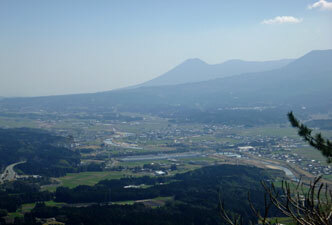 It was exhilarating stuff, sweeping round the bends and zooming down the straight stretches as views of the Sendaigawa Valley and the volcanoes beyond opened out. How quick was the descent compared to the climb and how it brought back the sensation of slaloming down a steep ski slope. When we got to the bottom, it was almost tempting to go back up and do it all again - one look back up at the mountains behind us quickly ended that idea. 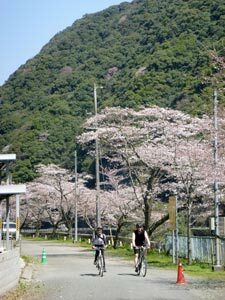 From the base of the mountain, it was an easy ride across the fertile river flats with their market gardens and paddies to finally follow the tow path alongside the Sendaigawa river into the town of Kyomachi Onsen. It was an early arrival and, after a feast of ramen noodles for lunch at the local noodle shop, we headed off to check into our hotel. 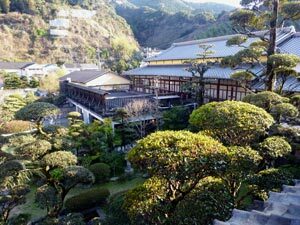 As was becoming the norm, a soak in the steaming onsen eased away the tiredness in our muscles. 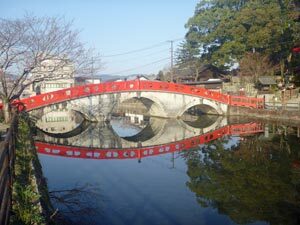 A short walk seemed in order to stretch a few different muscles and work off the lunch - so that there was room for dinner, which, as anticipated, was yet another feast of Japanese cuisine - my idea of losing weight on this trip seems to have faded into the past. This morning we farewelled two of our company, John and Hui, who returned to Taiwan. 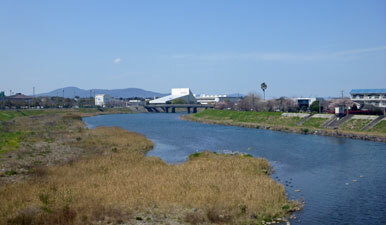 Thus, Thomas led a reduced peloton out through the streets of Kyomachi to pick up the tow path parallelling the Sendaigawa River. Overnight, high cloud had crept into the sky above and a watery sun did the bare minimum to warm us. The morning air though had changed from the cold of previous days to cool, and we cruised quickly along the raised tow path between river and fields. Today, I was sweep and I was quite content to hang about at the back of the peloton and enjoy the rural setting. 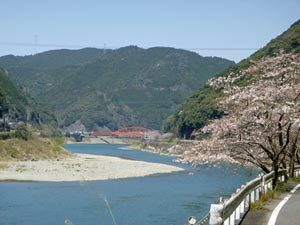 The tow path eventually came to an end, as did the fields - valley walls suddenly tightened and the Sendaigawa flowed swiftly through a narrow gorge, only to emerge onto another plain on the far side. 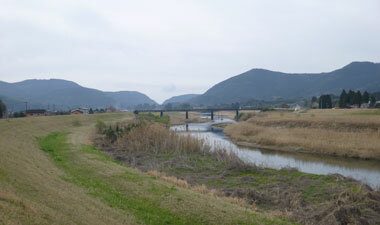 We continued our route on country lanes across the paddy fields and along the river's edge to reach Yunoo Onsen. It was time for our morning break, and what better place to have it than soaking our feet in a (very) hot spring bath while feeding on fruit and biscuits. 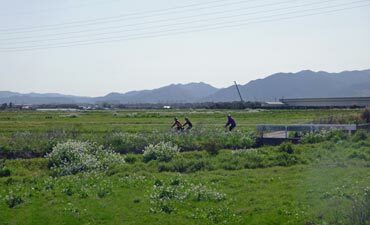 Across the road, Japanese retirees amused themselves playing gateball and seniors' golf - a couple of games of local invention. 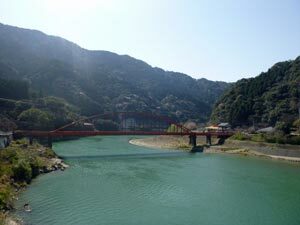 Leaving Yunoo Onsen, we crossed the river on yet another of the red iron bridges - this one guarded by figures of Kappa, a legendary water creature said to inhabit the Sendaigawa. 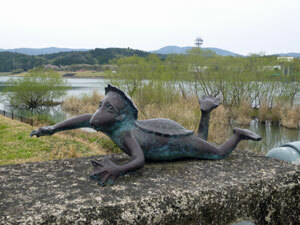 In a park across the river, near a small waterfall, we were introduced to the Kappa family - a series of statues of these curious creatures (a bit like the mutant ninja turtles). They seemed friendly rather than ferocious. 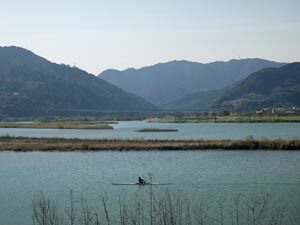 We pushed on, across a barrage on the river to continue our pleasant perambulation down the tow path next to the fertile rural lands of the valley. 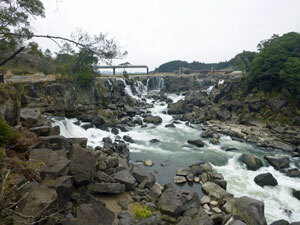 The next stop was the Soginotake Falls - a series of waterfalls and cascades amidst dark boulders as the river rapidly dropped its level. 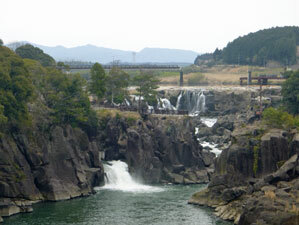 We crossed an impressive A-frame suspension bridge to reach the tourist centre at the falls. 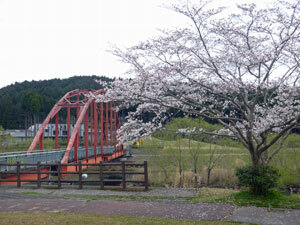 With its groves of cherry trees in full bloom, it was an ideal place for lunch. 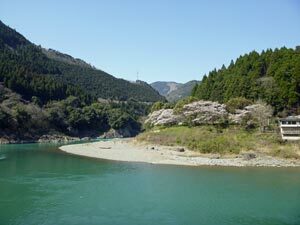 Once past the falls, we started to pick up the upper reaches of Otsuruka Lake, formed by the recently built Tsuruba Dam. 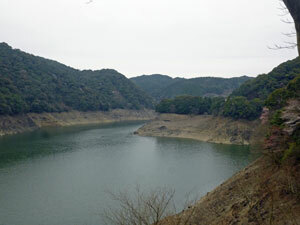 The rural landscape was long left behind as the narrow country road wound its way around the steep-walled and heavily forested valley that contained the lake. 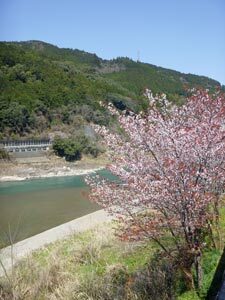 The odd cherry tree started appearing along the roads edge, then the occasional arbour of trees lining it, until on reaching the dam wall, we found ourselves beneath a grove of cherries in full bloom. They brightened up what was becoming a very dull day, as the high cloud had won through and the sun was now well and truly hidden. After a break at the dam, we pushed on - a short steep zooming descent to the base of the dam, followed by a climb and second descent to pass a particularly narrow section of the river. 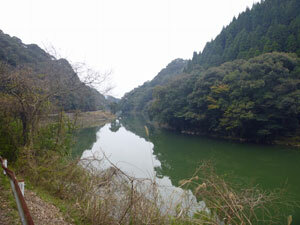 In this deep and shady valley, the still river waters reflected the green walls about them. 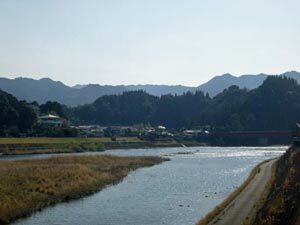 Gradually we drifted away from the river bank to re-enter a region of fields and scattered houses. 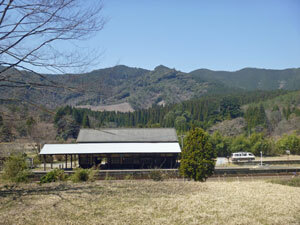 Our route gradually led us to the hill spa village of Shibi Onsen, surrounded by the forest and mountains. 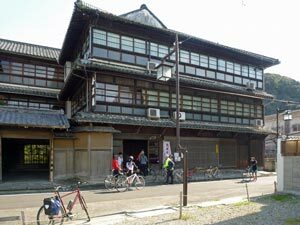 It was a pleasant spot to spend our second-last night of the bike tour and the open air onsen was an equally pleasant spot for our usual after-ride soak. It had been a long day in the saddle and the slightly sulphurous hot water of the spring soaked our aches away. 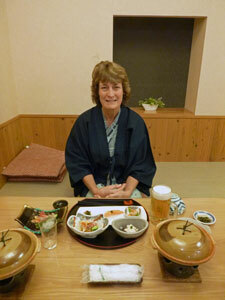 As usual, the dinner was a huge assortment of delicous Japanese delicacies, soup and shabi-shabi pot. What was unexpected was the appearance of a karaoke machine, where several of our fellow riders demonstrated their vocal talents (amazing what a shot of plum wine or shochu can do). 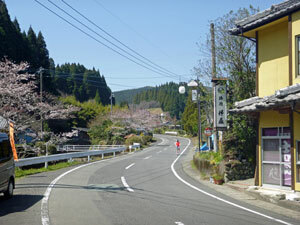 The star, however, was Maeda-san, until now the man with the friendly smile who drove the support vehicle and worked behind the scenes to organise snacks on the route and luggage transfers. 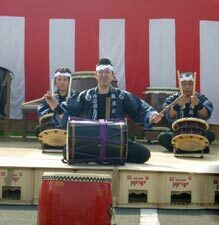 After tonight, we realised that the multi-talented Maeda-san was also a master of the Japanese drums and king of karaoke in Kyushu. It was a great way to finish the evening. The last day of our bike tour dawned clear and sunny and a good few degrees warmer. The cloud of yesterday had dispersed to allow us to finish on a good note. However, it was a day of more climbing. 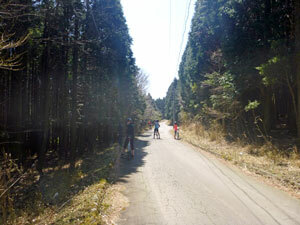 Thomas led the peloton back down the road from Shibi, to soon turn westwards towards the hills. 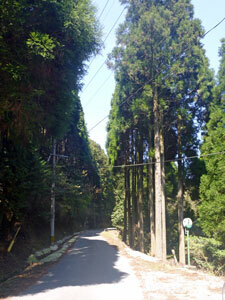 It was a quite a steep climb and I thought that we may have begun the ascent to the 645m Horikiritoge Pass, our route back to Izumi. Wrong!! It was just the means to get across to the next valley, and we cruised downhill into a narrow fertile region surrounded by green-clad hills. This valley provided the route up to the pass and we set off up it, gentle at first, but with the gradient gradually increasing. Too soon we ran out of valley and the climb began, at first up a wide local road and then by a narrow and very quiet road that wound its way up through the lighter green broadleaf forest and into the dark-green conifers. It was a superb mountain environment as we stopped for fruit and nibbles by the side of a deep, rocky stream that babbled its way downhill. I had long taken off all layers bar a t-shirt, and that was beginning to become damp with perspiration. 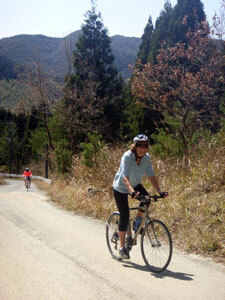 This climb had the steepest gradients of all we had done and, after five days in the saddle, it was beginning to tell. Even in the lowest gear, there were times when my thigh muscles burned with the effort needed to crank the bike ever onwards and upwards. 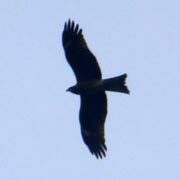 Some of the younger and fitter soon disappeared ahead, as we followed the stream upwards. The peloton was spreading out quickly, but at least the fair Nello let me stick to her rear wheel. It was a welcome relief to feel the gradient easing as we neared the pass and to finally sit on the flat top beneath the dome of Mt Shibi. 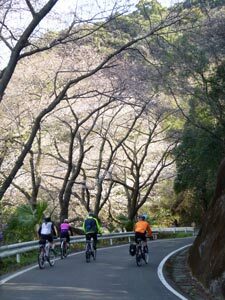 The climbing was not quite over, but before any more we had a few kilometres of steep and winding descent - a just reward for the effort of the climb. Windjackets on, we headed off, zooming down the straights with the wind rushing in your ears, braking hard for the sharp right-handers and slaloming through the gentler curves - it was yee-haa time, as we passed from the dark and shady conifers to broad-leaf forest and finally through a grove of light-dappling bamboo to reach a fork in the road. Here we stopped. 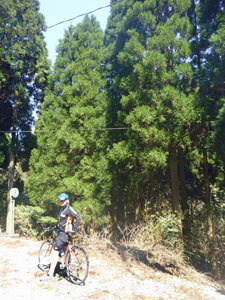 Our route lay upwards to 505m Torigoe Pass, back up through the bamboo into a mixed conifer-broadleafed forest. With a 10-14% gradient (steeper than some HC climbs on the Tour de France - though considerably shorter) the climb required a bit of effort - however, the exhilaration of the downhill section seemed to have given me a bit more energy and I actually found it less of a struggle. 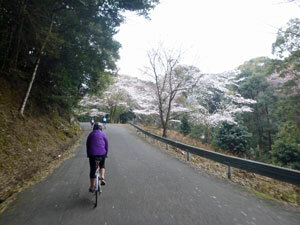 No more climbing lay between us and Izumi and, from the pass, it was one long 15km descent to the end of our ride - steep and winding at first, but more gentle and direct as we re-entered villages and the suburbia of Izumi town. It was one last chance to fly down the mountain - the best way to finish a six-day bike ride. 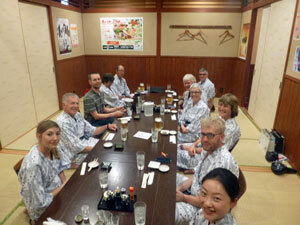 The tour officially ended that evening, with a last celebratory meal together in Izumi. We also got out a bottle of Shochu to toast the fair Nello - it was her birthday and if you can't celibrate with old friends, what better way than to celibrate with new friends. Thanks Helen and Kevin, Con, Steven and Joyce, Mandy, Ross and Abby, John and Hui, Maeda-san and Thomas - you were a great bunch of people and we enjoyed your company. 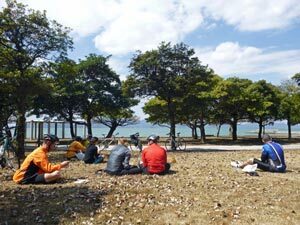 Finally, special thanks to Thomas and Yuko for plotting out and organising such an interesting and diverse ride - great scenery, great food and plenty of challenges. 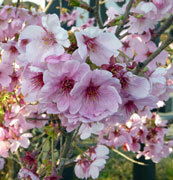 It was an excellent beginning to our time in Japan.